Messages. Genies. Tiny ships. All things people used to put in bottles, at least until it was discovered that bottles were much better used for holding beer. The discovery is said to have happened in the late sixteenth century, when a homebrewer went fishing and took a bottle of his beer with him (yes, beer and fishing have always gone well together). Being caught up in a good afternoon of casting, though, he forgot the beer on the bank. When he returned a few days later he found that the cork made a loud pop when opened, and that the conditioning was better than it was before. Thus was bottle-conditioned ale discovered, and the world has never been the same since. Here at Bearpaw River Brewing Company our path to bottled beer had a little more purpose, and technology, behind it. 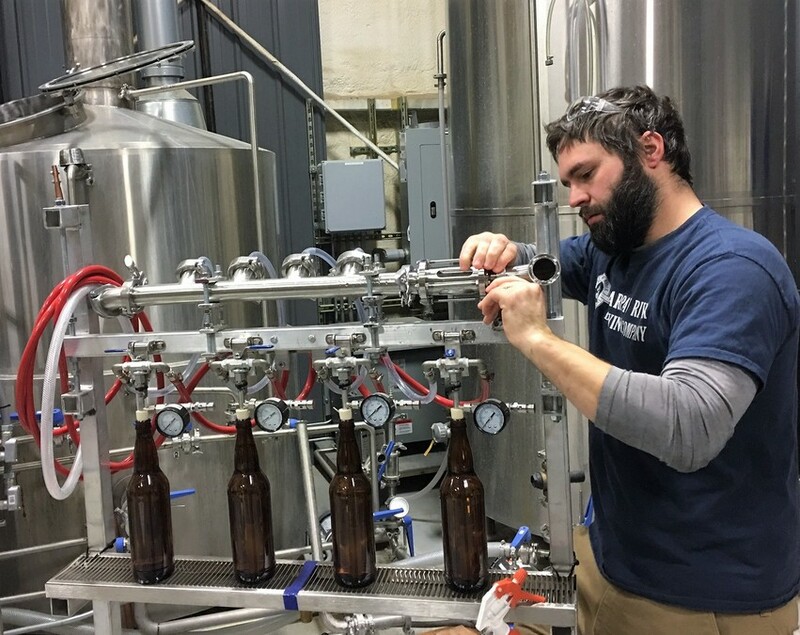 It all started about eight months ago when Jake built our bottling machine. He used top-of-the-line equipment, but true to our DIY approach to craft beer, he constructed it all by hand, piece by piece. Then came the test runs, and the strenuous work of taste-testing, where we worked out the kinks of the machine and the process. To ensure we got the carbonation the way we wanted it, we bottled a series of different beer styles in small runs, and popped the caps in intervals of days, weeks, and months. All of this coincided with the brewing of our Anniversary Ale, a big Russian Imperial Stout made to commemorate the brewery’s first birthday on December 17th. 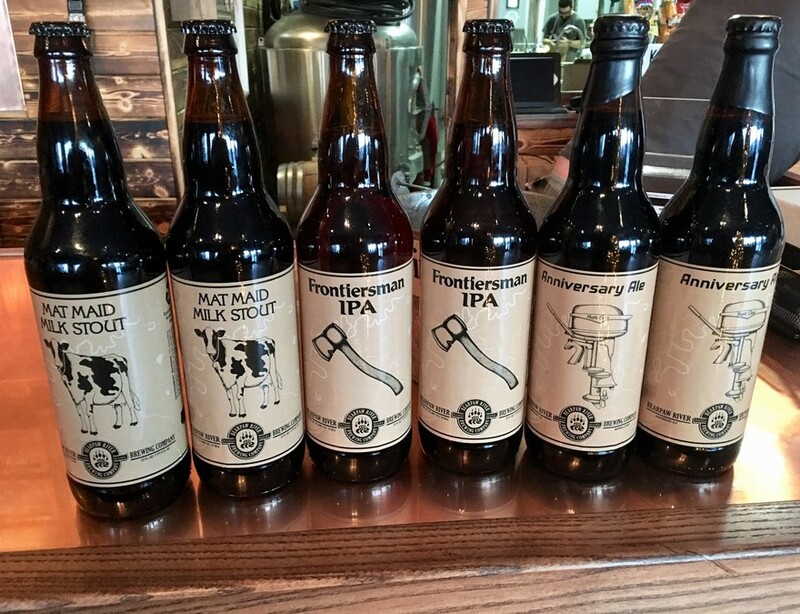 We started with a run of 225 bottles of the Anniversary Ale, and followed shortly after with even smaller first runs of our Frontiersman IPA and our Mat Maid Milk Stout. Soon, we will compliment these offerings with bottles of our Sluice Box Belgian. But long before the first 22 ounces of Anniversary Ale made its way into a bottle, we were hard at work on designing the labels. We were lucky enough to work with artist Anna Morehead, who drew the central images for the labels – an outboard, a hatchet, a cow, and a sluice box – but again harnessing our DIY approach, we all put our heads together to dream up the concepts and designs for the labels. Jamie’s technical prowess, and keen eye for detail, made those designs a reality. Then Jack went to his wood shop to make us a labeller. 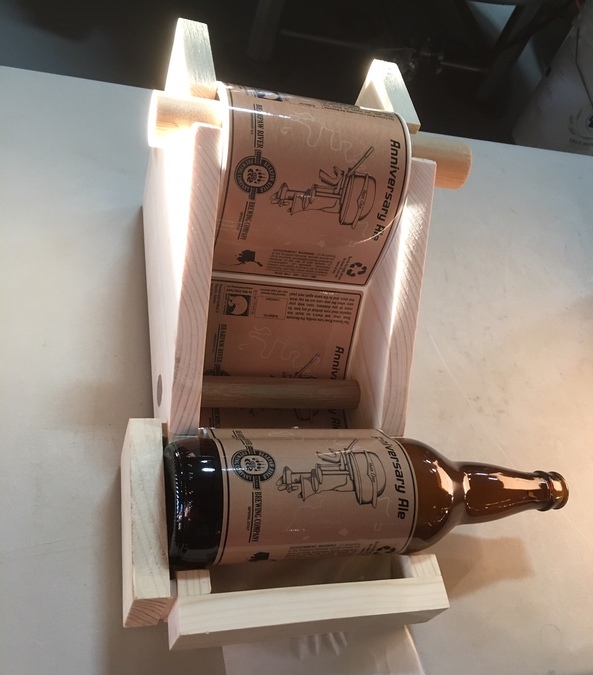 Just as our beers are hand-crafted, so are all of our bottle labels hand-rolled. 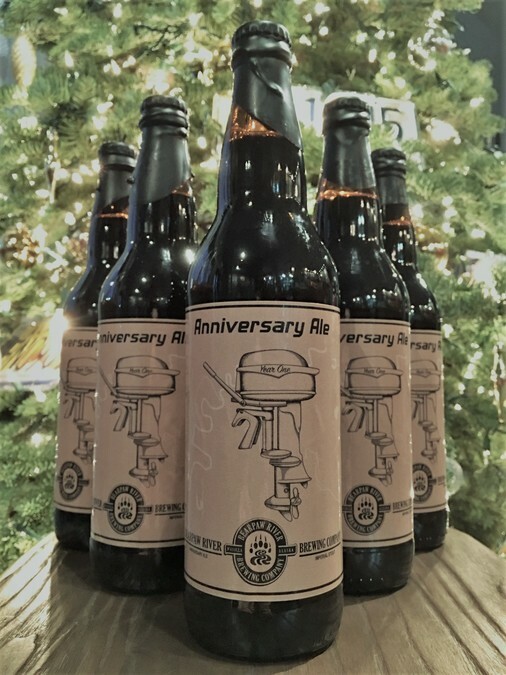 Bottles of the Anniversary Ale won’t be around again until our second birthday party next December, but we hope to keep bottles of the Frontiersman IPA, Mat Maid Milk Stout, and Sluice Box Belgian available in the taproom year round. We can think of quite a few situations in which they might be enjoyed, but we highly recommend taking a bottle on your next ice fishing expedition, or later in the year, on your warmer-weather fishing trips. Just don’t forget them on the bank.